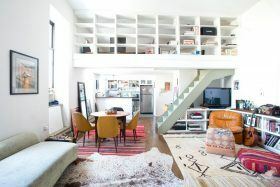 Space and storage are what this East Village loft has to give. The unit is from 300 East 4th Street, a brick cooperative built in the 1940s. While you can pick up a unit here for $1.299 million, this one is actually up for rent at $4,600 a month. With over 850 square feet, there are two mezzanines to hold a bedroom and a flexible bonus space. Custom closets were added, and built-ins line the walls, offering storage galore. Best of all, this lofty space takes in tons of light from five large windows.